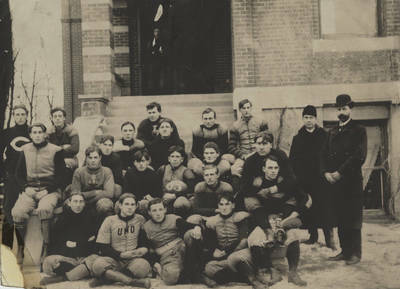 22 football players are seated on the stoop of a building; the two on the right side are Walter Hempel, the Athletic Director, and coach Rex B. Kennedy. Both Hempel and Kennedy lasted only one year. Holding the football is Victor Wardrope, team captain.